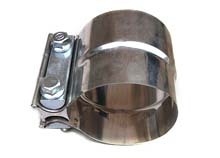 Exhaust Sleeve Clamps , also known as Muffler Clamps, Muffler band clamps or Exhaust Clamps. size 1″-6″ available from China manufacturer. it used for cars or trucks.